Resides in Barcelona, VZ in the offseason...Attended Keeping Kids in the Game; participated in the pregame ceremony prior to the annual ¡Fiesta Tigres! game. Appeared in 100 games in his first Major League season with the Tigers in 2018...Ranked fifth among American League rookies with nine stolen bases...Made his Major League debut in the second game of the doubleheader on April 1 vs. Pittsburgh, starting in left field...Recorded his first Major League hit on April 10 at Cleveland with a single in the seventh inning off Tyler Olson…also picked up his first big league run scored and stolen base in the contest...Finished a home run shy of the cycle on May 31 vs. Los Angeles (AL)…marked his first Major League game with multiple hits (3) and RBI (3)...Went 4x5 with three extra-base hits, including his first Major League home run, and tied a career high with three RBI on September 2 at New York (AL)...Appeared in 23 games with Leones del Caracas of the Venezuelan Winter League, hitting .267/.337/.326 with 17 runs scored, one double, two triples and three RBI. Played in a career-high 126 games with Double A Jackson in 2017...Ranked tied for third in the Southern League with 140 hits, while he was tied for fifth with a .292 (140x479) batting average...Had four hits on April 22 at Biloxi...also had four hits on September 2 at Tennessee... Finished the month of April with a .346 (28x81) batting average, 10 runs scored, six doubles, two triples, one home run and 14 RBI in 20 games...Hit safely in 11 straight games from April 24-May 9...hit .435 (20x46) with six runs scored, five doubles, one triple and seven RBI during the streak...Posted a .317 (32x101) batting average with 19 runs scored, nine doubles, two triples, one home run and 10 RBI in 27 games in July...Named Southern League Player of the Week for the week ending September 4 after hitting .538 (14x26) with six runs scored, two doubles, one triple, one home run and four RBI in seven games during the week...Played for the Salt River Rafters in the Arizona Fall League and hit .316 (25x79) with eight runs scored, three doubles, two triples and nine RBI in 20 games...was selected to play in the AFL's Rising Stars Game. 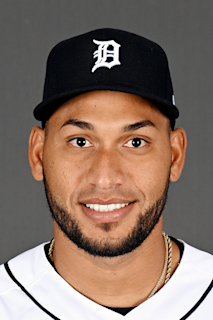 March 14, 2019 Detroit Tigers optioned LF Victor Reyes to Toledo Mud Hens. October 23, 2018 LF Victor Reyes assigned to Leones del Caracas. December 14, 2017 Detroit Tigers claimed LF Victor Reyes off waivers from Jackson Generals. April 3, 2017 RF Victor Reyes assigned to Jackson Generals from Visalia Rawhide. March 17, 2017 OF Victor Reyes assigned to Arizona Diamondbacks. October 2, 2016 RF Victor Reyes assigned to Leones del Caracas. April 4, 2016 RF Victor Reyes assigned to Visalia Rawhide from Kane County Cougars. March 8, 2016 RF Victor Reyes assigned to Arizona Diamondbacks. April 16, 2015 RF Victor Reyes assigned to Kane County Cougars. April 6, 2015 Atlanta Braves traded RF Victor Reyes to Arizona Diamondbacks for . April 6, 2015 RF Victor Reyes assigned to Kane County Cougars. September 22, 2014 Rome Braves activated RF Victor Reyes from the 7-day disabled list. March 31, 2014 RF Victor Reyes assigned to Rome Braves from Danville Braves. August 5, 2013 LF Victor Reyes assigned to Danville Braves from GCL Braves. June 21, 2013 Victor Reyes assigned to GCL Braves. June 1, 2012 DH Victor Reyes assigned to DSL Braves. July 2, 2011 Atlanta Braves signed free agent Victor Reyes.